If you’re running a small or medium-sized business, you will need to ensure that you have only the best server for your small business. The best small business servers are absolutely essential for any modern company, and while cloud-based servers are gaining popularity, on-site servers that you operate yourself can still be the best way to go. These small business servers will also be easier and more affordable to expand as your business grows. So, we went ahead and curated a list of the 10 best SMB servers, ranging from those aimed at small businesses to the sort that bigger corporations need to survive. Without further ado, let’s dive into the best servers for small businesses. There are so many different servers out there, and that means that you’ll sometimes have to sort through entire price lists in order to find the best small server for you. Just look at the Dell PowerEdge T30 – you can buy it either as a barebones or as a fully configured server. Aimed at the entry-level/SoHo market, the T30 manages to fit in a ton of expansion potential into a tiny, mini-tower-like chassis, and it even comes with a wealth of server features by default, which makes it a perfect alternative to an office workstation. Servers do not have to be massive or expensive. Take the PowerEdge T20 for example; it has benefited from a wealth of knowledge derived from the 20 years of experience Dell has building servers. While the barebones version doesn't have a hard drive, it's certainly cheap – in the recent past, it has been priced at less than £100 (with cashback offers, that is – it’s always well worth keeping an eye out for these). It has a Haswell-based Pentium processor that can clock up to 3GHz and supports up to 32GB DDR3 ECC RAM (note that this model comes with 4GB). Expansion capabilities include four SATA ports (32TB if you use 8TB hard drives), four I/O slots and 10 USB ports. Astoundingly for a PC of this price, you also get two DisplayPort connectors, a VGA one, two PS2 and one serial port. Other than a Gigabit Ethernet port, the other points of interest are a 290W PSU and an Intel-based RAID controller. Lenovo took over IBM's x86 server range back in 2014 and has built on the best of the ThinkServer tradition. The TS150 is now the most affordable of the range and is a 4U enterprise-class server that competes with the Dell T20. It comes with support for RAID 0,1,10 and 5 (via an on-board controller). Like the competition, this one can accommodate up to four 3.5-inch HDDs in total, which means that it can go up to 40TB of storage when loaded with the relevant hard drives. The relatively-recent Intel Xeon E3-1200 v6 processor should be powerful enough for small and medium enterprises. Lenovo also claims that the acoustics of the TS150 are even quieter than a typical library at 26 decibels. As is the case for the competition, you also get an impressive array of ports and connectors: eight USB ports, four PCI/PCI-e slots, three video connectors (including a pair of DisplayPorts), Serial, Gigabit Ethernet and three audio connectors. There is sometimes a very fine line between workstations and servers and there is probably no better example than the 5039A-IL from Supermicro. It is part of its SuperWorkstation range but works just as well as a server with acres of upgrade space. Given that it is a barebones solution, the 5039A-IL is especially suitable for small businesses with niche needs like creative houses that might want a server that's a bit more than just a print or file server. This single socket, mid-tower behemoth (it weighs in at 18.1kg without any parts) offers some impressive tech on board: You can specify Skylake processors (Xeon or Core i3/5/7), up to 64GB of DDR4 ECC memory, plus there's USB 3.1, HDMI, and twin Gigabit ports on the connectivity front, and 7.1 audio to boot. Its expansion capabilities are also breath-taking: DVI/DisplayPort/VGA, serial, eight SATA ports, six PCI/PCI-e slots and support for up to eight (yes, eight) hard disk drives, all powered by a 500W PSU. Supermicro, while not a household name, is one of the biggest server and workstation manufacturers out there with decades of experience. When you think about servers, Fujitsu is probably not the first vendor which springs to mind. And yet, the Japanese manufacturer is one of the very few (if not the only one) that can claim to be involved in anything from SMB servers to, well, supercomputers. The TX1310 is its entry-level, SMB-focused server and comes with some pretty solid credentials plus an unmatched, industry-leading reliability guarantee. If your server breaks down within the first year of purchase, not only will Fujitsu fix or replace it, the company will also refund you the amount you paid for the server. Like pretty much everyone at this end of the market, it is designed to run silently 24/7 and offers RAID 0/1/10 but not 5. This model incudes an Intel Xeon E3-1226 v3, two 1TB hard drives and 16GB of RAM. We like the fact that it comes with an optical drive and has two Gigabit Ethernet ports for redundancy. With four DIMM slots and four storage bays, this server supports up to 32TB of storage and 32GB of memory. One of the fastest growing segments of the server market is dominated by a single company. 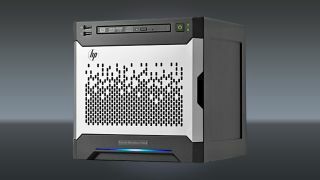 HP Enterprise's Proliant Microserver Gen8 has successfully managed to fend off competition – thanks to an attractive feature mix and plenty of discounts – and ultimately own this market. These tiny servers have found a market well outside their niche with prosumers buying them en masse and touting their obvious advantages over NAS (network attached storage). Despite being very small (less than 13l in volume) and light (less than 7kg), this machine packs some impressive capabilities. We're talking support for Intel's Xeon E3 family, up to 16GB of RAM, on system management processor, two Gigabit Ethernet ports, one PCIe slot, support for RAID 0/1/10, a DVD writer, up to four hard disk drives, an internal microSD card slot, an integrated Matrox G200 graphics chip and seven USB ports. It only has a VGA port, though, and has just two memory modules. If you want something a bit beefier than the aforementioned servers, then consider the TS460. It is far more expensive but then again you get a server that's in another league. For a start, it is far bigger than the previously mentioned servers with a 50 litre volume and a 25kg weight. This 5U server runs on Intel's Xeon E3 models with Turbo Boost technology plus it offers a three-year onsite warranty. It supports up to 64GB of RAM and its integrated RAID controller offers the four main RAID types. You get a DVD writer, four fans, a 300W PSU and two Gigabit Ethernet ports. Up to eight hard disk drives can be installed and there are a whopping eight USB ports as well. There's a lockable door, support for ECC memory, plus a serial and a VGA connector. Pitching in the same category as the TS440 is the ML350. This is an expensive piece of kit but just look at the feature list and it actually seems like a very decent deal. Other than the fact that it has a dedicated, integrated graphics card (Matrox G200), it offers a three-year onsite next business day warranty, four Gigabit Ethernet ports and support for 12Gbps SAS (note that it takes only 2.5-inch drives). But there's more – this server runs an Intel Xeon E5-2603 v3 processor (not the usual E3 CPU) and supports two CPUs. The E5 has six cores which makes it particularly well-suited for more taxing tasks. We're also impressed by the amount of memory slots (24) that it has, allowing it to hit 3TB of memory once 128GB LRDIMM roll out. Oh and other than a lockable front door and a storage controller, this server earns brownie points for having dual redundant, hot-swappable 500W PSUs. A powerful server doesn't have to be expensive – that's essentially what Scan wants to convey to prospective customers. Specifically designed for the SMB market, this 3XS offering is engineered to be compact and as quiet as possible. The UK-based vendor provides real-time tracking at every stage of the server build process (the servers are built to order, and production includes a 24 hour burn test and 88 point QC check ). Each comes with a three-year onsite warranty; what's more, you get a free recovery USB stick with diagnostic utilities. If that wasn't enough, the components used in the system are amongst the best in our round-up. Two Broadwell-based Intel Xeon E5-2603 v4 processors provide a total of 12 cores and 30MB of cache. Then there's 64GB of DDR4 ECC RAM from Samsung, a 1TB WD Enterprise-class hard disk drive, two Intel Gigabit Ethernet ports, a 1000W Gold PSU and support for eight hard disk drives. Built by Corsair, the case has a door and all the panels are lined with noise damping material. Like Supermicro, Asus is not well known for its servers. Instead, the Taiwanese company, one of the biggest component vendors in the world, is popular for a wide range of consumer products including its motherboards. Its TS500-E8-PS4 is a mainstream pedestal 5U tower server perfectly built for both workstation and server dual use. It features the latest Intel Xeon processor E5-2600 v3 product families, eight DDR4 DIMMs (supporting half a terabyte of RAM), six expansion slots, three 5.25-inch media bays and a single 500W 80 Plus Bronze power supply. There are four 3.5-inch hot-swap SATA/SAS HDD bays which is also upgradable to eight HDD bays for flexible storage requirements. In addition, with Intel's Intelligent Platform Management Interface (IPMI) 2.0-compliant ASMB8-iKVM module in the TS500 you'll be able to monitor, control and manage the server remotely. Other key specs include 10 SATA ports, a DVD writer, eight USB ports, a PS2 port, a VGA one and three Gigabit Ethernet ports. Note that this is a barebones server, but obviously that gives you plenty of flexibility - something this machine offers in spades.